Email sharing is easier than ever. Nowadays, with five clicks you’re all good to share emails with your team and increase productivity. However, what happens with any tool is that you need to know how to use it in order to make the most of it. So in today’s articles we’ve gathered some of the best practices when it comes to email sharing. So let’s take a look at it! When you work with your creativity, such as work in advertising agencies, is very common to have the clients on board for collaboration. 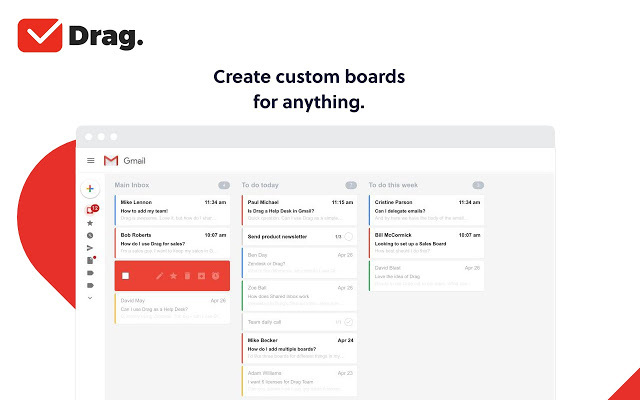 With a team inbox, you can add them to the conversation, inviting them to the board and getting real time feedback. Of course it depends on what type of project you and your team are working on. Sometimes it’s not useful to have a client on each step of the process because it can slow down the whole thing, but keep in mind that it works as well. With shared inboxes, you can create a specific board to each section in your company, so peers can collaborate easily without compromising everyone else. These section channels work great for communication and collaboration. And they can even work better for you than a Slack, for instance, because it’s directly in your Gmail, so you don’t have to be in many different windows to solve things. Everything happens inside your inbox. By using Kanban, shared inboxes get a boost, because they’re not only shared, but also much more visual. Centralizing teams work because it helps members to get a bigger sense of connection and belonging as well. If you have a big plan ahead and don’t plan to divide your team, you can divide your board for periods of time. Let’s say you’re starting with some people for one quarter, but then some more are being expected for the next quarter. Creating short-term boards can help your team feel more motivated as well. The sense of accomplishment gets very high when you separate work in smaller goals. And because team inboxes are so intuitive to use, you don’t have to worry about teaching new people about features. With the right tool, you can go much further. Our software doesn’t add any new logins/websites for your team. It works straight from your Gmail Inbox. All you need to do is download it here and activating it into your inbox by clicking the Drag’s switch. And that’s it, you’re ready! Centralize work in one single place, no there is more need to access tens of different platforms everyday just to get your team to communicate efficiently. By doing so, we allow your team to learn faster and have less questions about what’s new. We also centralize work, because we have Helpdesk/CRM functionalities and shared boards inside your email. Basically we change everything, but we keep it visually the same. The Kanban view is also incredibly helpful. By making all emails pop up visually, you can instantly understand in which stage everything is, and so you can spend less time on your email. The fact that Drag works inside Gmail decreases drastically the time to be invested to learn about a new tool. It also centralizes work, by allowing Helpdesk to be managed within the same space as emails and To Dos. Drag starts and stays for free, but if you want to unlock its full power, prices start at $3/month/user. We believe that simple solutions make everything better for both sides because they decrease the amount of new information you need to learn something new. All of it. Right into your Gmail team inbox. Using tools will always depend on how much you know about them, so take some time to understand the potential shared inboxes can bring to your team and then go for it. The more you’re active about this, the most your company will make from this change. so don’t be afraid to challenge yourself and then feel the difference in productivity after your team collaborates more in a platform as simple and crucial as email. Learn how to Transform your Business with Shared Inboxes by downloading our Ebook! Starting now, we’re aiming to share what our plans are, how we’re doing and what lessons we’re learning along the way. ▪ Just like this article, you’ll get real-time updates on what’s happening, what’s working and how it feels in a startup. This is our attempt at sharing everything. It’s as simple as that You don’t have to be a customer to follow us. Brazilian, lover of cats, travels and content.